Last week was a rainy one. I ran in pouring rain, soaked, my feet encapsulated in wet sponges formerly known as my running shoes. It wasn’t too bad though – I don’t actually mind being out in the rain. A little rain never hurt anyone (except the furballs from Gremlins – 80’s reference anyone?). I have such good memories of rain: Reading comic books in the attic and listening to the drumming sound of the raindrops on the roof; swimming in a lake during a thunderstorm (dangerous, I know); and seeking shelter with my dad and brother during a bicycle trip. We all squeezed into a tiny maitolaituri, a little wooden roadside shelter built for collecting milk canisters from dairy farms in the mid 1950’s, waiting for the storm to pass. If it hadn’t suddenly rained on that day, I wouldn’t have this wonderful memory of sitting there, thinking that my dad must be a genius for coming up with such a good shelter (I was maybe eight, and very impressed). And if it hadn’t rained last week, I would have probably quickly forgotten all about my last week’s runs too. Now, due to the downpour, they’re soundly stored in the “extreme sports” section in my cerebral cortex, all thanks to the rain. It’s like magic! Last week’s 20min runs felt surprisingly easy and I’m really looking forward to this week’s longer run. It’s amazing to think that a 20 min run can actually feel short when just a few weeks ago 5 minutes felt like it would never end! Now I have even found myself planning for a race in early 2013 – after March perhaps? I don’t really mind the cold and snow for running but the winter just doesn’t feel like the right time for a race. I have also noticed that my running shoes have started to feel quite chilly (the wind is blowing right through them because of the ventilation and it feels almost like I’m not wearing shoes at all) so I’ll have to see how long I can even run in them. My current running shoes are very thin and lightweight, close to “barefoot running” (Puma Faas 250) but I might need something a bit sturdier and waterproof for the winter. I’m off to my run #1 of the week! Toodle-pip! Today is Thanksgiving Monday here in Canada, and I’m starting Week 6 already. So far my runs have alternated short runs with walking. This week however, it’s time to level up with longer runs and kick it up a notch. When I started training six weeks ago, I was feeling really out of shape. Looking back, I was doing longer runs a few years ago so I should be okay with the 20 min runs, though they do sound a bit scary. The key is to try to remember to run with a slow and steady pace. I usually tend to pick up speed, especially if I have to run in front of people (it’s the my-god-they-can’t-see-me-go-slow!-syndrome) or if I’m going downhill. Warp speed is nice, but well, going slow would definitely help for the longer runs. I’m confident I’ll survive. I did my first run of week five yesterday and decided to try a new route. I feel I have walked/ran pretty much every trail and park in Toronto over the years, so I decided to take the subway up to North York, to Leslie station, and explore the East Don River Parklands (I’m not sure what the park or trail is actually called but it is very easily accessible right at Leslie subway station). Since I really enjoyed being away from the downtown core for a change, I wanted to explore the route a bit more and did a longer walk after finishing the run. Total: 1h of exercise with 15 min running. The route was very nice with the autumn colors starting to emerge and the Don River flowing across the park. There are many bridges crossing the river along this trail, which I loved. I could almost imagine being back in the woods again – definitely a well-needed change from running downtown and I’ll definitely go there soon again to run the parts of the trail I didn’t get to explore yet. For me the autumn has always felt like the best time to start a new project. Compared to the New Year, the autumn just has a special energy to it. Since the weather is also perfect for sweating outdoors, I thought I’d start a ‘couch to 5K’ running series here and post about my progress, going from an out-of-shape person into running the full 5K. 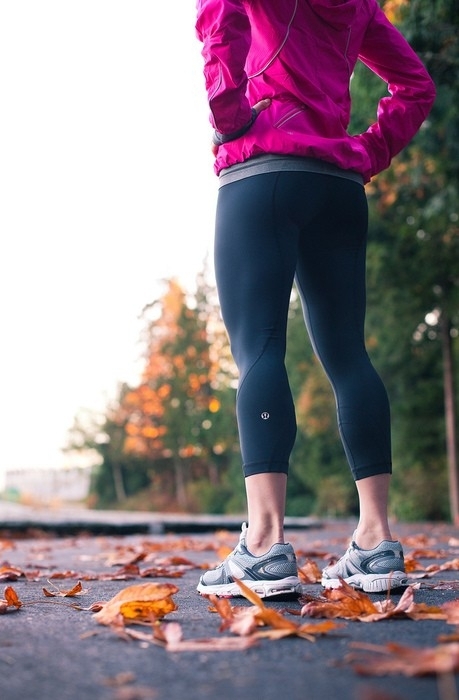 Every run starts with a 5 min brisk walk warm-up, and ends with a 5 min cool-down, followed by stretching. I run 3 times a week, with minimum one day rest between runs. As you can see, it is a pretty simple training plan that gradually builds endurance. Going into week 5, I’m going to be doing longer 5-minute runs moving gradually into more running and less walking. I will be writing soon about my running history (or rather the lack of it! ), and about how my training in detail. The ‘Ultimate Goal’ (oooh!) is for me to run a full 5K race easily, so that the running feels enjoyable and not like I’m going to pass out (which would be the case if I’d try to run the full distance now). At this time I’m not really concerned with my time or speed, and am just trying to build endurance and a better breathing technique. One, two, three – The 5K challenge is officially launched!